After you clip all of the wires from a power pole, use a Copper Wire and run it from one pole to another, just as you wold a Red or Green Logistics wire. You can control what’s connected to what that way. Is there a shortcut to put something from my inventory to my toolbelt? I know the toolbelt is now just a shortcut to what's in my inventory, but when I get some transport belts, I'd like them on my toolbelt. I have to open inventory, click the transport belts, then click where I want it on my toolbelt. I instinctively tried shift or ctrl clicking or something like that to snap it to the next available slot in my toolbelt, but that obviously didn't work. Is there a shortcut or do I have to do it manually like that every time? with no result - any hint why its not working under 0.17.3 ? I have not played with it enough to know how to save the toolbelt from one game to the next, but you’re supposed to be able to do exactly that. This enables you to set it in one game, and then not have to set it again. That’s also why there are 10 rows in the toolbelt, two of which are active. I don't think that's correct. As far as I know you can't do that. But the feature has already been suggested repeatedly in the short time since 0.17 landed, so I'm hopeful that they'll add something like that. I'm not necessarily talking about saving my toolbelt across save files (but that would be cool!) I am talking about a convenience shortcut to get things from my inventory to the toolbelt. I started a new game with an empty toolbelt, and when I gathered wood I opened up my inventory and picked it up and placed it on my toolbelt. I'd like to do something like "CTRL-Click" so that it automatically shortcuts to the next available slot. It's just a laziness feature, just like how ctrl-click automatically puts items into production machine slots (furnace, assembler etc). If that's not in the game, I'll request it! It's not in the game. 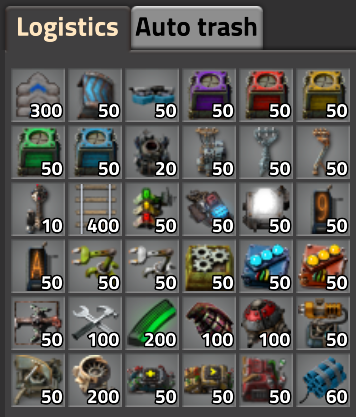 There are bindings for Shift-click and Control-click in the inventory, but they relate to putting items in the Auto Trash slots that you get once you have Logistic Bots. Shift-click moves the stack you clicked on to Auto Trash, control-click moves all of that item type to Trash. I've heard several other people mention this so I guess it is something people want. If a new shortcut were added, I guess Alt-click would be an option. I believe there's already at least one mod to add something like it. Personally I think the best way to work with the quickbar is to get it set up in advance - something that will be a lot easier if/when they implement the idea that ManaUser referred to, and allow saving quickbar config between games. But even as it is now, the way I do it is to get my quickbar set up at the beginning of the game with all the items in the game laid out across my 10 quickbars, in categories. I always want belts as quickbar 1, slot 1. I always want fish as quickbar 2, slot 5; assemblers as bar 3, slot 1. And so on. Once that's set up you a) always know where a given item is, and b) don't have to worry about adding items each time they're crafted. They'll always be in the same place, ready and waiting for you to acquire them. The only changes that potentially have to be made over time is swapping out yellow belts for red then blue and assembler 1 for 2 or 2 for 3, etc. But I realise perhaps not everyone wants to use it that way, so you're certainly not alone in wanting a shortcut. Check the Suggestions forum, I wouldn't be surprised if there's already a request for it there. I’m not at my computer ATM so I can’t check, is there a way for the upgrade planner to ignore splitter for example and only upgrade belts and underground belts? I haven't checked in 0.17 yet, but looking at a picture from one of the FFFs, it looks like you'll have to set which items to upgrade and to what. It looks like if you just specify upgrading belts and under ground belts that is all you will upgrade. You can also specify the splitter and not say what it should be upgraded to. But why do you want to skip the splitter? Won't that just reduce the down stream volume to the original amount like you had an un-upgraded belt in there? I’ve checked, if you don’t specify anything it will upgrade everything, if you do specify things it will upgrade what you want which is what I was hoping. Can anybody tell me, if the tooltip in the miners and the minimap, which shows the expected amount of ore, is calculated with or without the mining productivity bonus ? The expected yield you see on the map is simply a count of the pieces of stone/coal/ore in the ground. Productivity bonuses are just that - bonus. It's the actual amount in the ground, ie. without any productivity bonuses applied. why i cant set up inactivity time in train schedule more than 120 seconds? i can set up "time passed", but not "inactivity". Sorry if my english is poor. Is there a way to pin the inventory/crafting menu to a position? i dont want it to open always in the middle of the screen and blocking my view. Sorry if I bother you, but what's the way to "build" a "buffer" of items for personal use? 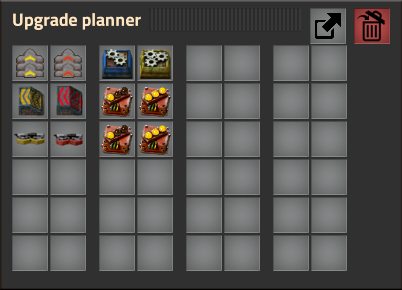 I want to make a "storage" where put something of the most used items available only for me, but with priority over the normal logistic network. I've thought that buffer chests can do the job, but the buffers are limited to te excess of loistic network, being used as target after the requester chests, then how can I do this? For be more clear I want to have a "requester chest" with highest priority over other chests, but that let items inside availale to the personal logistic satisfaction. How can I do it? The wiki tell that buffer chests are served after the requester ones, then... I'm a little perplexed. Last edited by Foreros on Sat Mar 09, 2019 5:54 pm, edited 1 time in total. Sorry if I boter you, but what's the way to "build" a "buffer" of items for personal use? Using logistic requests for these items ensures that my inventory is always stocked with the number specified. And with upgraded armour (Power Armour Mk2) I have lots of inventory slots, enough to keep pretty much all the building materials I need with me at all times. Personal logistic request slots have maximum priority in the network - items will be delivered to you before they go to any Requester, Buffer or Storage chest. Maybe you want a bigger buffer than you can keep in your inventory? If so, then you need a more complex solution. There is not a type of chest that is 'higher priority than Requester'. You can set up a bunch of Buffer Chests for these items, and they will both receive items from the network and can deliver items to the network (but can only deliver if Requester chests have 'Request from Buffer Chests' ticked.) But as you say, they will receive items before Requesters. This is a bit hard to explain, so if you want me to make an example for you, let me know. Another idea, even more work: Set up a separate production area - like a second mall - which is in its own separate logistic network. That second mall could produce whatever you want, and place it into Passive Provider Chests, and nothing could touch the items in those chests except you the player because it's in a separate logistic network. And if you put some Logistic Bots in that separate network, then any time you moved into it your personal Logistic Request slots would be automatically refilled from that second mall. But maybe another question should be: what is the problem you are trying to solve? Is your production not enough to give you all the items you need? Maybe that should be solved instead of complex solutions for personal buffer chests? Anyway I hope I understood your request correctly and that this is of some help. Let me know if you need any more info. I've thought something similar to this, but I need a lot of wires for connect every "buffer chest" to each requester. I've not tried the potential of new version circuit network, but if it cannot be sent throught logistic network I see the thing hard to set. I've the circuit block, where I make Electronic Circuits, Advanced Circuits and Processing Units, the various production areas and so on. Is like connect all the USA throught a red wire. But this can be a solution using a mod that give high speed bots to reduce the "waiting time" between shippings to "support area". p.s. : I dont want to have inventory filled with all useful tings, but I dont want to wait too long, if making something specific, for have it filled back. And I dont want to wait too long when in need because I have to wait the production of them and relative shipping time. The buffer area is a more efficient way for "refill" my backpack when entering in the "logistic" buffer area. This was considered a bug and has been fixed now, in case you missed it.